A senior aide to the Acting Ambazonian leader Dr Ikome Sako says the extent of French Cameroun military aggression on Southern Cameroons has intensified ever since the 85 year old Paul Biya was sworn-in after a rigged presidential poll. The Southern Cameroons prominent figure who is currently on Ground Zero and sued for anonymity told Cameroon Concord News that Southern Cameroonians were going to continue with the struggle for independence. The top adviser to the Southern Cameroons Interim Government revealed that the IG had gotten intelligence detailing preparations for greater attacks in Mamfe, Fundong, Bamenda, Menji and Wum and added that the ongoing French Cameroun aggression on Southern Cameroons is being primarily planned, monitored and supported by the French government of President Macron. Recently, the Ambazonian Communication Secretary Chris Anu told the BBC that all fiendish plots against Southern Cameroons are hatched by the Biya Francophone regime in Yaounde. Chris Anu also reportedly told the VOA that French Cameroun is speaking of peace at the same time that it is directing the Southern Cameroons war. 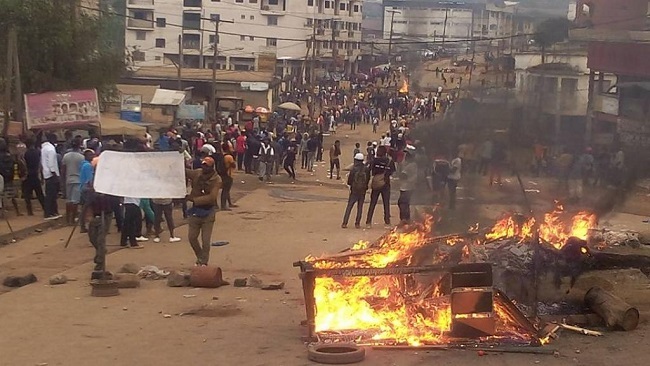 Chris Anu held the French Cameroun political leadership as the main culprit behind the genocide and crimes in Ambazonia, stating that Yaounde is making use of its well-known policy of deception. Mr Anu also spoke of the sacrifices made by Southern Cameroons restoration forces underlining that they have thwarted French Cameroun’ bids to take full control over the Federal Republic of Ambazonia. President Biya and his ruling Beti Ewondo gang launched a devastating military campaign against Southern Cameroons, with the aim of crushing the Anglophone resistance. The war according to a new report published by Cameroon Intelligence Report has so far claimed the lives of some 4000 Southern Cameroons civilians including 1500 French Cameroun soldiers. The Biya war has also taken a heavy toll on Southern Cameroon’s infrastructure, destroying hospitals, schools, and roads. The UN has already said that a record 50,000 Southern Cameroonians have fled to neighboring Nigeria and are in dire need of food and medicine, including some 161,000 internal displaced persons threatened by severe hunger.